On our Karma Yoga journey to Dominica from January 5, 2008 - January 19, 2008 you are invited to experience Caribbean culture, daily yoga posture practice and Karma yoga, and the fulfillment of making a meaningful and positive difference. This 14-day program provides an inspiring new type of volunteer vacation that unites humanitarian work with the underlying mission of selfless service and Karma Yoga. The program offers adventure, cultural immersion, and the opportunity to transform the self in the captivating "Nature Island of the Caribbean", Dominica. Our program brings us to the 3 Rivers Eco Lodge, a small, award winning, Green Globe certified accommodation situated in a lush green valley surrounded by tropical forest. This package lasts 14 days, it inlcudes food and lodging with an optional stay with a family in our local village, Grand Fond. Locals claim that there is a river for every day of the year in Dominica. 3 Rivers is named so because of its close proximity to the many beautiful rivers that flow through the unspoiled island. The idea behind this peaceful lodge was to create the ideal getaway for the environmentally conscious. The 3 Rivers respects the environment and works closely with the locals to create an ambience that is a mixture of cultures, natural wonder, and a vacation experience incomparable to any other. This volunteer vacation provides us with the opportunity to practice our commitment to yoga in myriad ways and places, both on and off the mat. You''''ll work from your heart through your hands among friendly people in a beautiful country - this is a journey that transforms and unites your self and the world. The whole village surrounding 3 Rivers is poor, and struggling to find ways to replace the dead banana industry that kept Dominica going for generations. Family is strong, so the old and the sick are cared for home, by people with no money. The nation has chosen tourism, and diversifying towards organic agriculture as the answer. Working with a poor village, to develop the tourism and agriculture is exactly what is needed by participants who wish to help. View, print and save a copy of the flyer for this trip in a ".pdf" file suitable for printing on your local color printer. Dominica (pronounced Dom-in-eek-a) sits midway along the Eastern Caribbean archipelago, just a few miles from Martinique to the south and Guadeloupe to the north. The island''''s official name is the Commonwealth of Dominica, which is mostly referenced in official communiqué and to distinguish the island from its northerly Caribbean sister, the Dominican Republic. The indigenous Carib Indians named the island Waitukubuli which means "tall is her body" in the Carib language. The island is sparsely populated with around 70,000 people inhabiting its 289.5 square miles. A significant portion of the population lives in and around the capital city, Roseau. 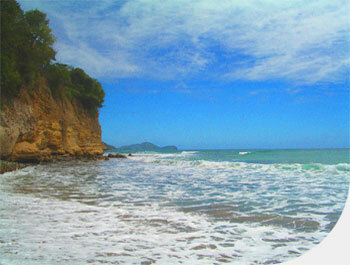 Dominica is an arcadia of unspoiled nature. Tropical forest coats two thirds of the island, which nourishes 1,200 plant species. Rivers, lakes, streams, and waterfalls abound, fed by the islands high annual rainfall. Its volcanic physique points to extensive geothermal activity above and below sea level. The Morne Trois Pitons National Park was the first UNESCO World Heritage Site in the eastern Caribbean. The island is one of only a couple in the Caribbean still with populations of the pre-Columbian Carib Indians. About 80% of the population is Roman Catholic. English is the official language, spoken with a melodic French lilt, but a large portion of the population speaks Kwèyòl (Creole), with a few northern villages speaking Kokoy. It is volcanic in origin with steep mountains, submerged volcano craters, a boiling lake and numerous hot springs. It is truly unique in its lush, natural beauty. The rugged, unspoiled landscape of some of the highest mountain peaks in the Caribbean and deep valleys are covered with rainforests, impressive waterfalls and exotic flora. Its evergreen oceanic rainforest is one of the last in the world! Locals claim that there are 365 rivers, one for every day of the year so you are sure to enjoy a dip in the crystal clear, refreshingly cool water. The hiking, mountain climbing and exploring are awesome. Hiking tours throughout the island can be arranged, as strenuous or easy as you like. There are 167 recorded species of birds so you are sure to spot a few. Most of the beaches are not the white sandy variety; instead you will find gorgeous black and gold sand beaches speckling the coast. The scuba diving and snorkeling is some of the world’s best due to the clarity of the water, sheer drops and pristine coral reefs. The Scott''''s Head ~ Soufriere Marine Reserve (SSMR) is located on the south-western tip of the island was founded to ensure that this remains true. Whale watching is popular off the shores of Dominica and playful dolphins often accompany the boat. The World Wildlife Fund and other conservation groups have even based documentaries and conferences here to observe the whale population. Dominica is truly like no other place in the world. In some ways it seems that modernization has passed it by. If you are looking for a true escape from the hustle and bustle and ready to really slow down to island time, you are sure to have an unforgettable experience on this truly unique island. Currency: Eastern Caribbean Dollar (EC$) or ‘Ecee’ is tied to the US dollar. Bank exchange is $1.00US to $2.67EC. US currency is widely accepted but expect a $2.50 rate. Plug types: "D" and "G"
Although credit cards are accepted at major restaurants and hotels depend on them, ATM''''s are available and travelers checks can be exchanged at local banks.